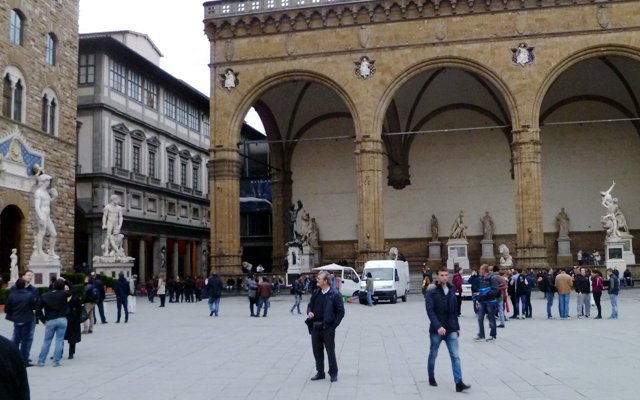 Piazza della Signoria is the civic, public, beating heart of Florence. To this day, the mayor’s office is housed in the fiercely fortified city hall built at the start of the fourteenth century and ceremonies of all sorts are played out here. The piazza is laid out as a stage set. The palazzo della Signoria (or Vecchio), and the Loggia form a scenographic corner projecting out to the piazza – the raised aringhiera in front of the city hall and the raised platform protected by the vast three bay loggia are the stage set from which in pre-Medicean times the city’s governors interacted with the citizen body. More often than not this was a place of communication – the word aringhiera shares a common root with the public address or “harangue” – the place where the town crier communicated new laws and policies to the city. On ceremonial occasions the piazza was decorated to honour the arrival of important guests: popes, emperors and significant embassies. As a place of authority, the piazza was famously the site chosen first for the Savonarolan “bonfires of vanities” (when pagan texts and images were burned) and later for the imolation of the preaching firebrand himself. But as Giovanni reminds us, from time to time the interaction between government and city was more of a dialogue. At parlamenti, when important decisions for the polity were put to public vote, the entire citizen electorate was in attendance in the piazza, and would cast a yes/no vote. On other occasions, such as the famous Ciompi revolt of 1378 or the bread riots of 1497, when the cries for bread (Pane! Pane!) turned to cries for a return of the Medici to power (Palle! Palle! ), the piazza was the pre-eminent stage for popular protest. This gives the piazza its special quality – it is a “practiced” place – an urban space where the repeated action of government and governed has left a permanent deposit or trace on the physical fabric. That trace is underlined by the monumental buildings, but also by the accumulation of public sculptures here – many of them symbolic of the city’s proud independence – as exemplified by Michelangelo’s statue of David which guards access to the city hall.